Any information for building a dropdown button at the Dynamic Area with sub buttons inside? Not sure what you’re asking for? You can place a drop-down button in the Dynamic or global areas. You can set the anchor within any of the drop-down items to open dropdown. 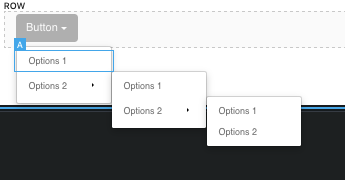 You can nest that (set the drop-down in the lower drop-down to open another drop-down). I don’t know if there is a way to make the sub items buttons, you may be able to style them with custom classes.